A Texas hospitality company considers where to invest and where to cut back to weather the recession. Circle R staffer Michael Bajorek, atop Sugar, welcomes guests. Have the credit lines on your business credit cards been cut recently? Circle R guests enjoy signature barbecue and queso sauces. Event services manager Erica Landry creates ambiance. 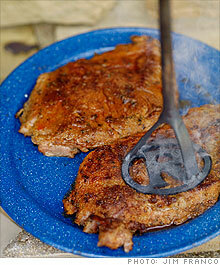 Clients holding events at Circle R can have the steaks branded with their company's logo. From sloppy accounting to poor hiring, here are the business-killing traps that every entrepreneur must avoid. 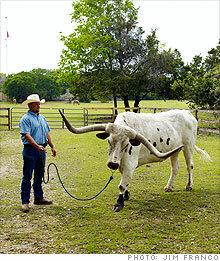 Guests can pose with Whistler, a 1,600-pound Texas longhorn steer. 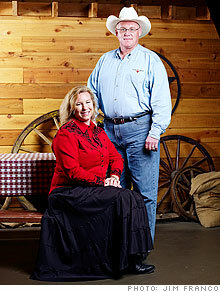 DALLAS (Fortune Small Business) -- Making merry is serious business at Circle R Ranch, located 10 miles north of Dallas in bucolic Flower Mound, Texas. Known for its over-the-top hospitality, the ranch hosts meetings and conventions for some of the world's biggest corporations. When Hyundai commissioned a bacchanal for its best salespeople in 2007, Circle R created an arctic blues bar where partygoers sipped frozen drinks and shot pool on a two-ton table made of ice. The ranch also maintains a herd of white longhorn steer in case rowdy CEOs want to prove that they have the chops to ride them -- as quite a few have done. But these are sober times. 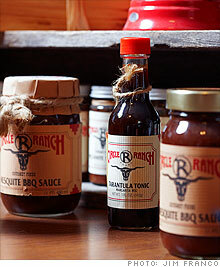 Ranch revenues plunged 38%, to $2.5 million, in 2008, from a peak of $4 million in 2006. Circle R is still profitable and debt-free, but for the first time in a decade, the ranch is struggling to fill its calendar. Amid the global economic downturn, clients are cutting back on razzle-dazzle such as fireworks and staged gunfights, resulting in tighter profit margins for Circle R. After years of catering to the extravagant whims of big-spending corporate party planners, the ranch may be forced into the dreaded wedding market, which means smaller budgets and more demanding clients. Owners Steven and Wendy Foster wince at the thought. Veterans of the hospitality industry, Steven, 53, and Wendy, 40, pride themselves on providing five-star service. Arriving guests are greeted by beaming cowgirls and cowboys who steer them toward the three Bs: beer, barbecue and bathrooms. Visitors can even order steaks branded with their company logos. But maintaining high hospitality standards is draining for the couple and their employees, all of whom put in long hours. (A dozen or so key staffers work year-round; that number swells to about 200 during the spring and fall party seasons.) The Fosters want to strengthen Circle R's all-important operations department, where burnout has been a problem. They also want to hire a general manager who shares their commitment to customer service. Fortune Small Business recently lassoed three experts to help the Fosters map out a slump-survival strategy. For marketing advice we turned to Prentice Howe, 34, creative director of Door Number 3, a marketing and advertising agency in Austin. Experienced in online marketing, Howe scored a coup with a much-praised Website redesign for the Dallas/Fort Worth Area Tourism Council. After a rambling tour of weathered barns and rustic pavilions along the ranch's rutted dirt roads, Howe sits down with the Fosters in their knotty pine-paneled conference room and promptly offers a blunt assessment of their Website. Designed in 2001, it features fuzzy, outdated photos of business folk looking awkward in cowboy duds, sort of like The Office meets Gunsmoke. The only video on the site offers a panoramic view of an empty campfire pit surrounded by picnic tables and hay bales, with the camera spinning around the scene fast enough to induce vertigo. "Your Website is a well-worn boot," Howe says. "You can do a spit shine or buy a new boot. I vote for the new boot." Steven looks chagrined. "I know we're behind the curve on technology, but it is a tough time to invest in the site," he says. 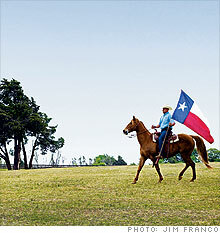 "And we've always scored big with meeting planners when we give them personal tours of the ranch." Howe stands his ground. A new Website would likely cost Circle R about $20,000, but it's a vital business investment. Most corporate meeting planners are in their twenties or thirties and have embraced technology with a vengeance, he says. They go online to evaluate potential event venues, especially now that corporate travel budgets have been trimmed. Few planners have the time or the money for such excursions. That's why it's crucial for the site to capture all of Circle R's sights and sounds. His prescription: crisper, more contemporary photography; an online tour; and short videos that highlight festivities such as rodeos and campfire sing-alongs. Banish the site's kitschy photos of cowboys with guns on their hips and saloon girls in rip-'em-off red bustiers. Instead, feature photos of the ranch's grizzled cook, Buck Cave, at the barbecue pit. "I'd like to see photos so good that I can almost smell the steaks sizzling on the grill," Howe says. "You're not selling meeting space; you're selling an experience." Next up is Susan Steinbrecher, 49, founder of Steinbrecher and Associates, a management consultancy based in Dallas. She began her career in the hospitality industry and now advises several of the country's four- and five-star hotels and resorts. Steinbrecher is used to economic adversity: As general manager of an Embassy Suites hotel in the early 1980s, she struggled to please guests and retain her best workers during a bruising recession. Steinbrecher says the key to maintaining the ranch's topnotch service is effective communication with staffers. "Every single person on the property must care just as much as you do about pleasing the client," she says. To that end, the Fosters should survey all employees at least once a year, she says, and hire an outside firm to administer and evaluate the results so that workers won't fear being penalized for honest criticism. Ask them why they want to work at Circle R, what they like about the experience and what could be improved, Steinbrecher tells the couple, and make sure their personal goals align with yours. Such surveys will reveal not only if the training is effective but also if employees are being managed properly. "Remember, 60% of workers who leave don't quit a company," she warns. "They quit a boss." Every year at the start of the busy spring and fall seasons, the ranch must hire and train scores of new staffers. To retain the best and the brightest of the seasonal help, Steinbrecher urges the Fosters to send past employees a friendly e-mail during the winter, updating them on Circle R news. "This is a family business," she says. "Research tells us that family is everything to today's younger workers. Even at work they want to feel a part of a family. Your messages should emphasize the sense of togetherness that gives the client a wonderful experience at Circle R."
Despite the downturn, the Fosters must also focus on recruiting an experienced general manager, adds Steinbrecher. "You can't keep up this pace," she says firmly, looking at Steven and Wendy. They nod in agreement. Each regularly clocks as many as 100 hours a week at the ranch. "This is your best opportunity to find talent," Steinbrecher adds. Hard-hit by the slump, big hotels and resorts are laying off staff. The couple should recruit workers who have been trained by properties with the same high standards as Circle R.
"Frankly, a lot of people are tired of corporate America," Steinbrecher says. "Emphasize the opportunity employees have to make a difference at a smaller, family-run company like yours." FSB's third expert is Gene Fairbrother, 54, president of MBA Consulting in Dallas, who has helped numerous companies turn their troubled businesses around. He urges the Fosters to keep tight controls on food and beverage costs at Circle R, especially during the downturn as clients trim their meeting budgets. Such costs typically account for 7.8% of the ranch's total operating expenses, far less than the industry average of 20%. But Circle R's profit margins are shrinking as clients cut back on extras such as fireworks and rodeo shows -- which makes it all the more important for the Fosters to keep a close watch on food and beverage costs, the most significant line item in the operating budget. "Any leeway you may have had in the last couple of years is disappearing," Fairbrother notes. He advises the Fosters to break down food and beverage costs in detailed spreadsheets and scrutinize them weekly. Several weeks after the Makeover, Steven and Wendy are busy implementing several of the experts' recommendations. They will undertake a complete overhaul of the ranch's Website later this year, and they intend to engage a human resources consultancy to conduct an employee survey. The Fosters will likely delay hiring a general manager until business picks up -- next year, they hope. The couple have hired a midlevel HR specialist to help train and manage staff. Circle R's calendar is beginning to fill up with meetings and other events, including a few weddings. In fact, the Fosters predict that 2009 revenues will be flat at $2.5 million, which they see as a victory in these recessionary times. Clients are booking smaller and less showy events -- three-day meetings instead of four, and no fireworks -- but the barbecues will be smoking again this year. 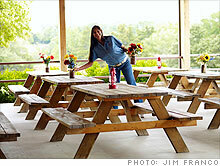 We'll keep an eye on the ranch and let you know how things turn out for Circle R.
Could your business use a makeover? In general, successful Makeover candidates are profitable small companies with at least $1 million in annual gross revenues. To submit your firm for consideration, e-mail the FSB makeover editor here. Please describe your business briefly, provide your most recent and projected revenues, and explain why you think your company would benefit from a Makeover. What's your advice? Tell us what you recommend for Circle R.